From 1894 to 1974 Seaford was an urban district run by Seaford Urban District Council. In the Local Government reorganisation of 1974 it became an unparished area that was part of the Lewes District Council remit. This loss of independence was unpopular with Seaford residents and on 6th May 1999 a series of ballots was held amongst the electorate to determine whether they wished to have a Town Council. Further to the elections the town became a civil parish within Lewes, with an official Town Council as of 18th May 1999. From May 2003, Seaford (including Bishopstone) has five wards; Central, East, West, North and South. There are four Town Councillors representing the residents within each of those wards, giving a total of 20 Councillors, including a Mayor and Deputy Mayor. 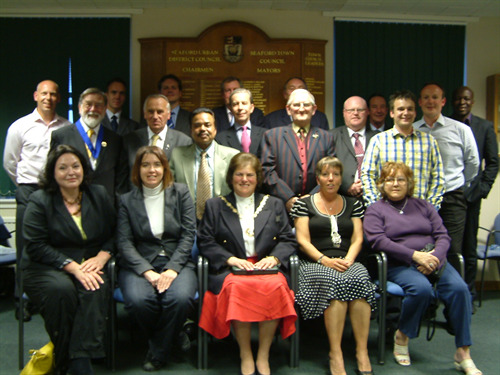 In 2009 Seaford became the first town in the South East of the country to elect a Young Mayor. The scheme was set up by the Council in partnership with Seaford Head Community College, with past Mayor of Seaford, Councillor Carolyn Lambert, working closely with the school and youth of the town to get the scheme up and running. Further information is available on the Young Mayor page. Municipal services within Seaford are now provided by three tiers of Local Government - the County Council (East Sussex), the District Council (Lewes) and the Town Council. The Seaford Community Partnership is a body incorporating representatives drawn from all three tiers of local government and from local civic groups. The partnership seeks to advise on long term development strategy for the town. Seaford has an estimated population of 27,000, 22,000 of whom are of voting age. Currently Seaford is the largest town in the area of Lewes District Council. Seaford finally got a coat of arms which was presented to Seaford Urban District Council on April 8th 1953 at a ceremony held at the Council Offices at Crouch House, Bramber Lane. Coldstream House now stands on the site of the old offices. It is believed that the coat of arms was mounted on the original chain of office presented to S.U.D.C. by F M Coldstream of the Corner House as a memorial to his son who died on active service in India. The presentation of the chain was made at a special meeting of the Council in April 1947 when Councillor Stanley Whitehead J.P. was Chairman. The coat of arms is still worn by the current Lewes District Council Chairman as Seaford Town Council decided to continue to use this chain of office when S.U.D.C. 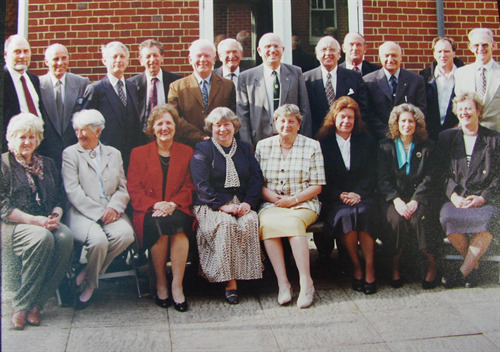 was amalgamated into Lewes District Council in 1974. Many local organisations still use the badge with permission from Seaford Town Council In suitably formal words, the document states how the Chairman had requested “that armorial bearings be duly assigned to the said Council” and these had been granted. The Lymphad or ship is similar to one on Seaford’s original corporation seal, a reminder of the town’s former status as a port. The half-lion/half-ship device appears on the badges of many Cinque Ports member towns, and here serves as a reminder that Seaford for some hundreds of years was associated with the group as a “limb” of Hastings. The eagle, also represented on the old town seal, comes from the arms of the de Aquila family who owned land hereabouts in medieval times.The heraldic colours, agent, gules and sable mean silver, red and black. The motto “E Ventis Vires” translates as “From the wind – strength”, and I have been told it was devised by Miss Dinah Synge, herself once Council Chairman. The document is signed and sealed by Sir George R Bellew (Garter Principal King of Arms), Sir Arthur W S Cochrane (Clarenceux King of Arms) and Sir Gerald W Woolston KCB (Norroy and Ulster King of Arms), all three being Knights Commander of the Royal Victorian Order. The original coat of arms is now on display at the Council offices in Church Street. 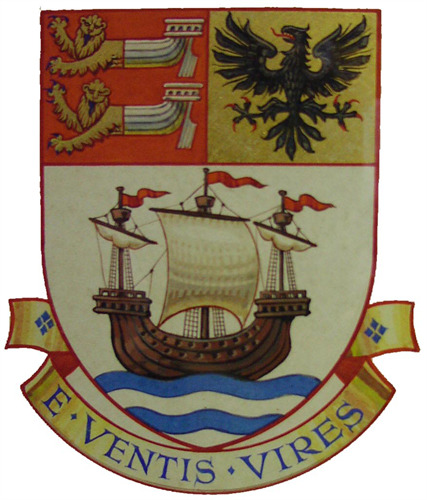 The Coat of Arms were formally transferred to Seaford Town Council in May 2001; any individuals or groups wishing to use the coat of arms must make a formal request in writing which will be considered by the Council.